As a child, he was mesmerized by the pictures in his history books, and knew they revealed the story he needed to tell. For his fifth birthday, he was given a camera, and encouraged to capture his life’s most significant moments. He did, and became known for his savvy chronicling. He knew then he was born to be a photojournalist, and came to treat his private haunts in the way one treats their favorite plants, their treasured relatives, and the things that make them feel good. He developed into one who documents the power of time’s passage and records history’s most valuable and treasured moments. Today, years later, he sat in his hotel room, glancing out the window. His adult eyes scanned the many rooftops, each protecting a different life story. The stories awaited his telling, and he breathed in the history of the moment, the ancient world touching his heart, and the new day opening its arms. He left his room, carrying his notes and camera. At first, it all seemed rather incongruous – the old walls of the town - the new adventures to begin. But it was merely another page in his life’s journey. Once used as a shoe polish factory, Memmo Alfama hotel is a bright and breezy townhouse tucked away in a maze of cobbled streets twisting between ancient churches and Fado restaurants. Inside, smooth lines, crisp sheets and laid-back lounges beckon; outside, the river-view pool bar is Lisbon’s latest spot to see and be seen. With its spacious rooms overlooking the Tagus and Alfama rivers, guests can take in the breathtaking views of the area with unmatched hospitality provided by the hotel's famously attentive staff. Just minutes away from popular attractions and the historic districts of downtown Lisbon, the Memmo Alfama is your luxurious home away from home while exploring the city. Discover something new while visiting Portugal and let the hotel's staff take care of your every need in an unforgettable setting. The Alfama Superior Rooms are our most spacious accommodations, offering you a face front view over its red tilled roofs of Alfama merging with the deep blue of the Tagus river. That's why they are a great staying option for living the Authentic Lisbon you'll never forget. rate includes breakfast, WIFI and all taxes. Booking must be cancelled 2 days prior to arrival to avoid penalty of one night. What's better than a breath taking view over Lisbon's most splendid Hill? This room has access to a common terrace with a small wooden deck with 2 chairs overlooking Alfama and the river. Twin or double occupancy. View over Alfama and the Tagus river. Along with the open wide views through the red tilled roofs over Alfama and the Tagus river, is the ultimate comfort of this homey bedrooms. 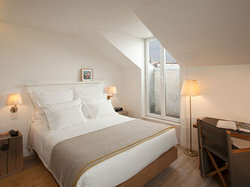 The mansard rooms are located in the rooftop of the hotel and do not have direct views. However, stepping into a typical stair of Alfama one can enjoy one of the best views in the hotel.